I believe this light is new enough that it’s not on Lumintop’s site officially. (I couldn’t find it anyway.) The 1.0 version is on the site, but this is the updated, 2.0 version. 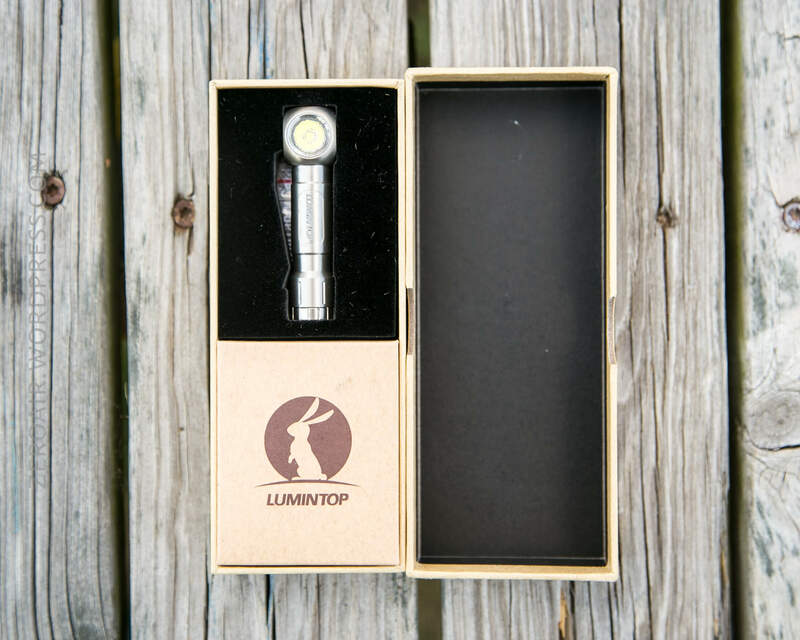 The link above is Lumintop’s official store. I believe there’s only one version. On the $25.99. As this is a very new product (and also $25.99 is a fine price), that price will probably stay around MSRP for a while. However, Lumintop was kind enough to provide a coupon!! it’s for 15% off, and here’s the code: S36H8LTYX8MU. I can’t think of another single AAA headlamp in my possession, and I like this one. It’s a great format for headlamp use. There are some UI issues that I’d like to see fixed, but generally this is a nice little light! Lumintop uses a slip-fit cardboard box much like many other manufacturers. 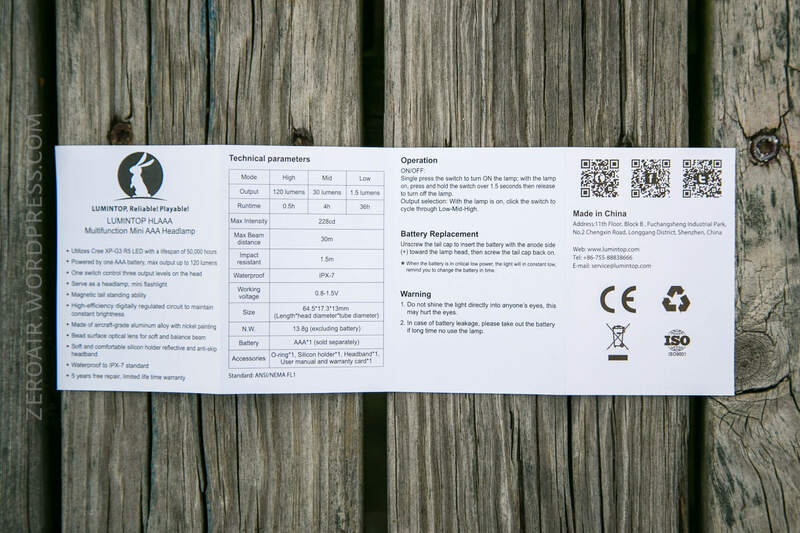 No photo of the light, but there is some text on the back with features (no UI). The light is held in some foam, and the goodies are in a separate box. The manual is a typical Lumintop manual. The specs/features are the same as on the box, but added is an output/runtime table, and a bunch of other specs, and a UI description. This is a well built little light. I’ve said it before and I’ll say it again – I find that manufacturers often don’t take the time and care with these smaller lights. That’s not the case with this light. 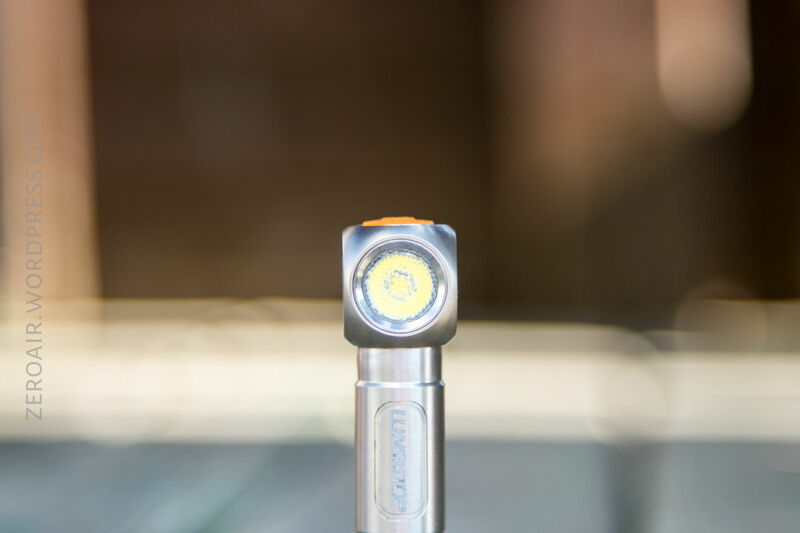 This is a well built, robust little light. The body is listed as “aluminum alloy” but it has a very good feel – much like the “titanium alloy” of lights like the BTU Mini I reviewed ages ago. The head has some fins for cooling. The body has connection points for the headband, which double as points for the pocket clip. As far as disassembly, there’s not a lot good to report here. I was only able to take the light apart to the default level. That is to say, to the level required to change cells. It looks like the head is threaded on to the body tube, but I wasn’t able to disconnect these pieces. As such, I can’t say how possible it is to get at the driver, or emitter, for swapping. Officially 64.5mm long, and very thin. This is a tiny light, a fact that’s impressed me every time I’ve picked up the light. Compared to some other random triple A light I have (and I have many in this class! 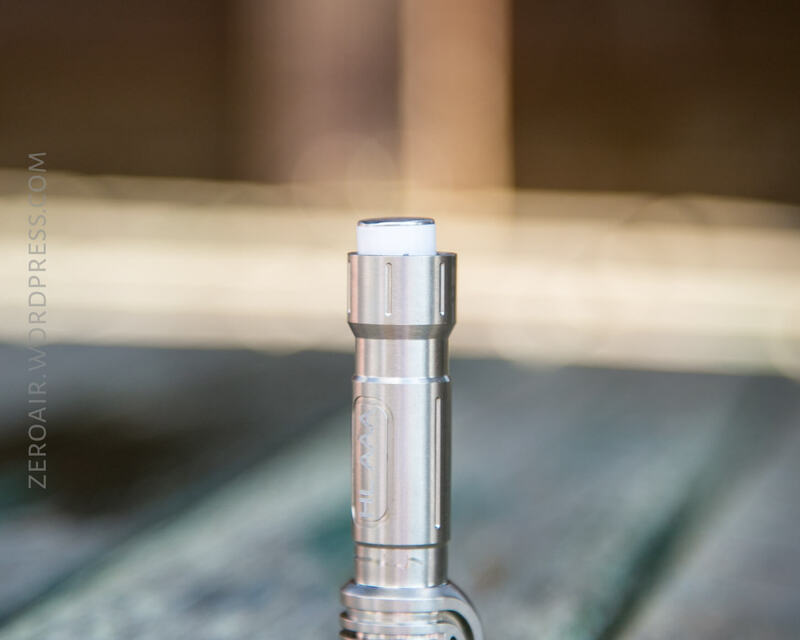 ), the HLAAA 2.0 is shorter than this Olight. Notably the HLAAA 2.0 also has a clicky, so if you’re like me and don’t love twisty lights (which most single AAA lights are), then you might love the HLAAA 2.0! 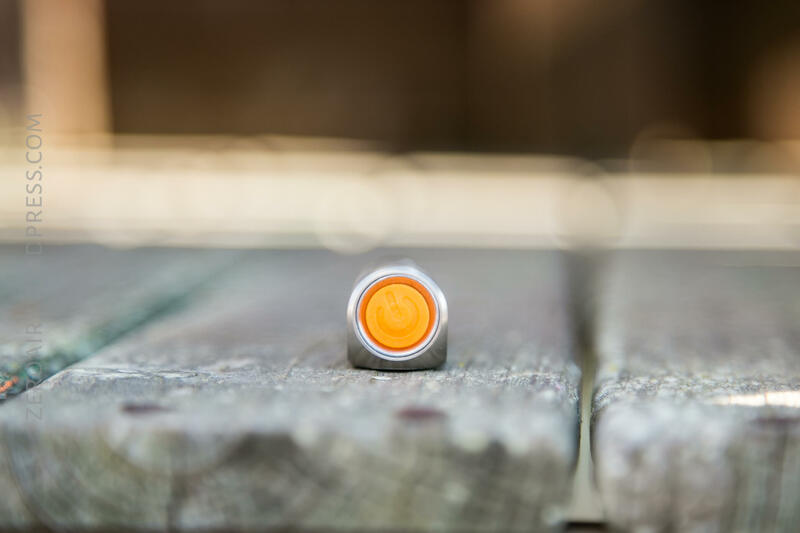 The secondary way to carry this light first: the pocket clip. This is a fine pocket clip. Nothing special but gets the job done. It’s reversible, and can carry with head up or down. The tertiary way for holding on to this light is the magnet. 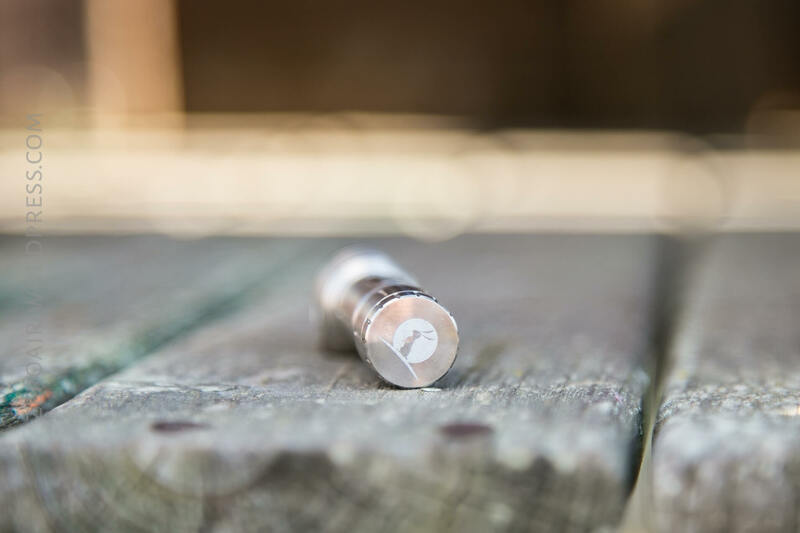 The tailcap has a strong magnet that easily holds the HLAAA 2.0 in any position. I do not believe the magnet can be removed. On to the primary means for holding this light; the headband. This is a superior headband and not simply because it’s covered in orange accents. The headband is thin, and the silicone gripper allows the light to rotate easily. Also notable on the head band is that there’s a bit of grippy… something on the inside, for promoting secure grip and not allowing movement by the headstrap. I’m sure over time this would wear off, but I like it for what it is. 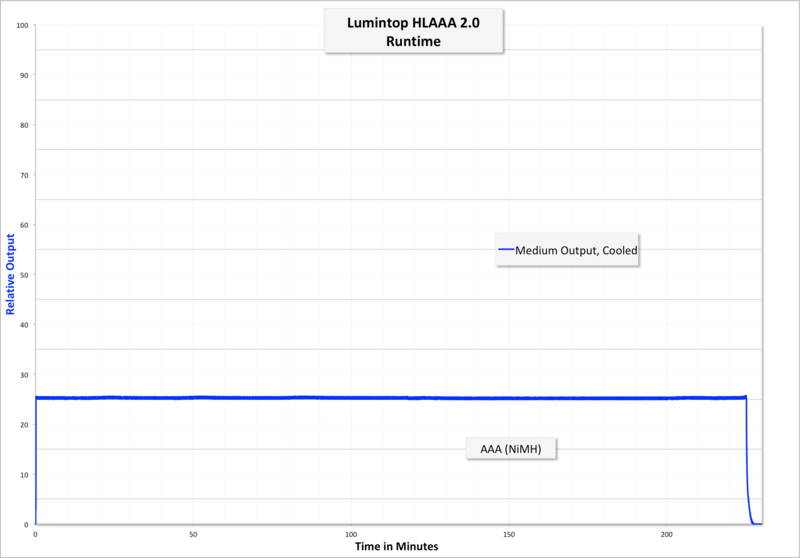 The Lumintop HLAAA 2.0 is powered by a single AAA sized cell. Primary (alkaline) cells are fine, as are NiMH cells. LiIon AAA sized cells (10440) are not acceptable: the working voltage is 0.8-1.5V. 10440 would likely kill the light. The cell sticks out a little before the tailcap is installed, and the tailcap fits over the cell. That’s a little unusual but doesn’t cause any operational problems. Also likely allows for the light to be so short, too. Here’s a runtime on High, and then a runtime on Medium. High is particularly impressive, since the light maintains stable output for nearly the entire duration of performance. There’s a single e-switch on the HLAAA 2.0. And for the size of the light, it’s a nice big button. Just a touch squishy, but positively clicky. It’s orange, so clearly superior, too. The switch doesn’t glow or indicate, but when the light is on, the light shows through the switch (coincidentally, not purposefully). Truly one of the simplest UI’s I’ve ever put in The Table™. * One gigaaaaaaantic asterisk there on the “Turn off” row. Many people hate “hold for off.” I am not one of those people. I like other things better, but I don’t hate that. This UI brings a new special appreciation for the “good” “hold for off” UI’s. On those UI’s, the light switches off at the appropriate time after holding. On this UI, the light doesn’t switch off until you’ve 1) held the switch long enough, and 2) released the switch. That might not sound like much, but there’s no feedback as to when you’ve held the switch long enough. And the light stays on until you release….. I found this very minor “feature” to be much more frustrating than it has any right to be. That’s it for the UI. There are no strobes, no hidden extra-low, no nothing else. If you appreciate simplicity, and/or absolutely never want to get strobed in the face, then this might be the light for you! 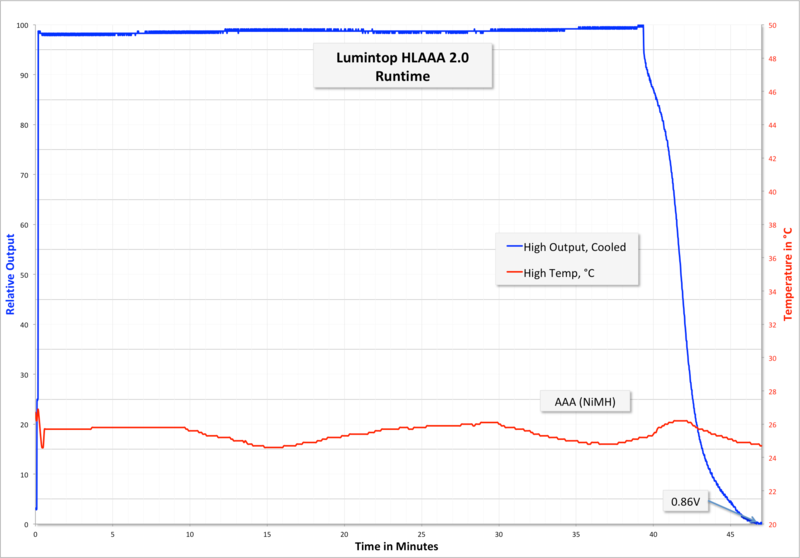 Lumintop has chosen to put a Cree XP-G3 emitter in the HLAAA 2.0. It’s behind a dimpled TIR optic. The beam is extremely diffuse, but does seem to easily hit it’s throw rating of 30m. 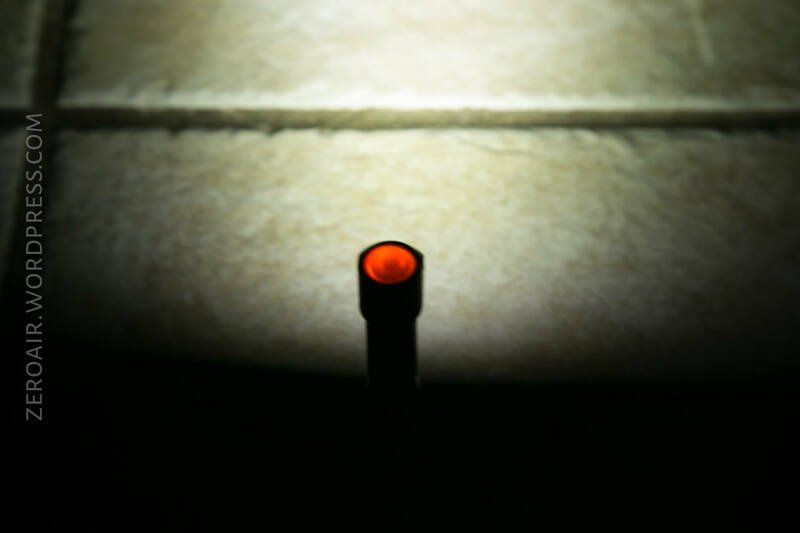 Cree XP-G3 isn’t the most well regarded emitter in some of my circles. I tend to agree that in the periphery, it’s a bit green. But in the center, the beam on this light is a nice white, and overall it’s just fine for me. Some notable competition to this light is by Manker and Fenix. 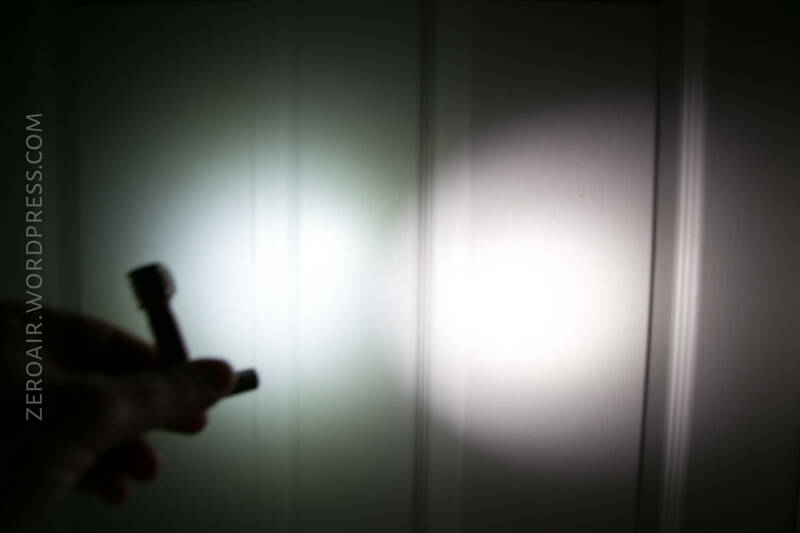 Manker has the E02H which I have not reviewed, (but I have reviewed the similar E03H here). 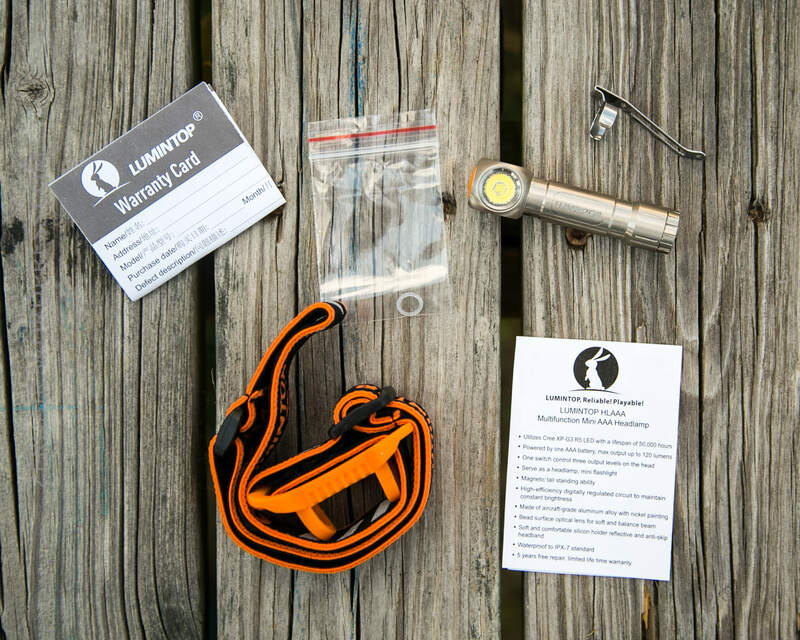 It’s a nice headlamp with a very versatile UI, and is available with Nichia. 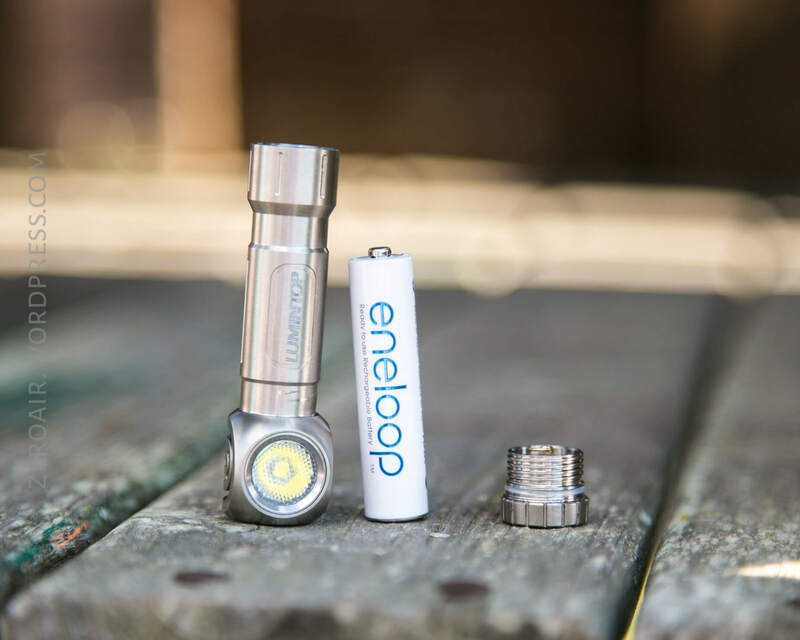 I like the body of this Lumintop much more, but the UI and Nichia-ness of the Manker E03H. *This specific version of Hold-for-off does not work for me at all. Added 10440 support would be nice. A hidden ultra low (4th mode) would be a good bonus. More flashlights! I should have the Imalent RT35 done this week, and I hope to finish out a few other posts that I’ve been sitting on for [months, in some cases]. This light was provided by Lumintop for review. I was not paid to write this review.